You have 3878 characters. Don’t forget to add important and relevant keywords in your description to improve your iTunes app page and optimize your SEO. Your app's last version was released on March 29, 2019. It is important to regularly update your app. Best practices recommend to update your app every 4 to 6 weeks. This means fixing reported bugs, improving existing features, launching new features etc. Keep an eye on users' feedback. The next great features may already be asked by many users. Download the app for a 30-day free trial. 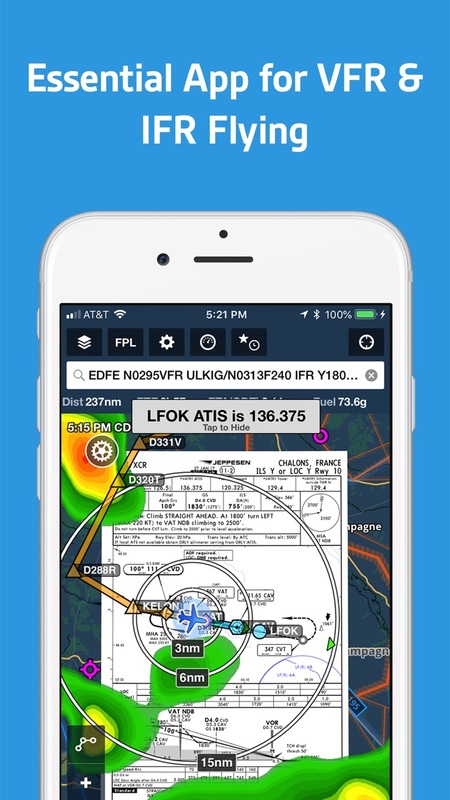 ForeFlight is the integrated flight app with all the essentials for VFR & IFR route planning, flight plan filing, and flying in Europe. ForeFlight is the most widely used application by individual pilots and professional flight crews to access weather and airport information, plan flights with optimized routing, file flight plans via EUROCONTROL, access and manage electronic charts and maps, reference flight manuals and documents, avoid terrain and obstacles with powerful hazard awareness tools, access in-flight traffic (and weather where supported), and aid enroute navigation. Please note: Location is used to enable a moving map and to record track logs, push notifications are used for important bulletins and flight alerts, and contacts are used to add people to flights. 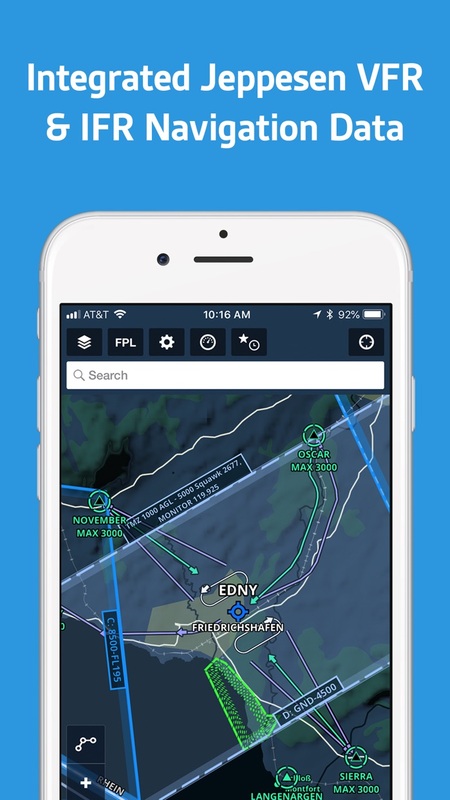 ForeFlight’s state-of-the-art map engine gives the app its signature speed and fluidity when panning and zooming. 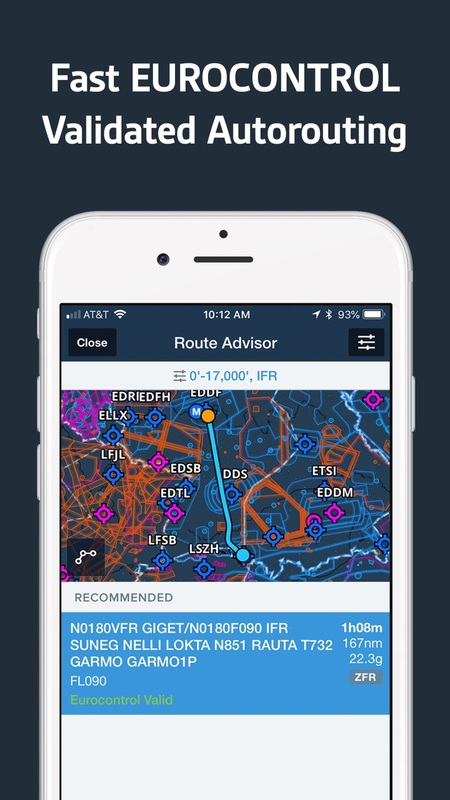 Data-driven Aeronautical map uses Jeppesen’s global VFR and IFR navigation data to depict waypoints, airports, airspace, airways, arrival/departure procedures, circuits, holds, no overfly areas, and more to support VFR and IFR flying in Europe. Europe geo-region includes AIP enroute, procedure, and aerodrome charts and documents provided via EUROCONTROL. Optional add-ons include Jeppesen VFR Procedures, Jeppesen IFR Airway Manual coverages, and the German DFS VFR AIP and Charts. More countries and coverages to come. Plan routes using the interactive Maps tab or the form-based Flights tab. Graphical Route Advisor produces EUROCONTROL validated routes within a matter of seconds. Simply tap the desired route to add it to your plan. 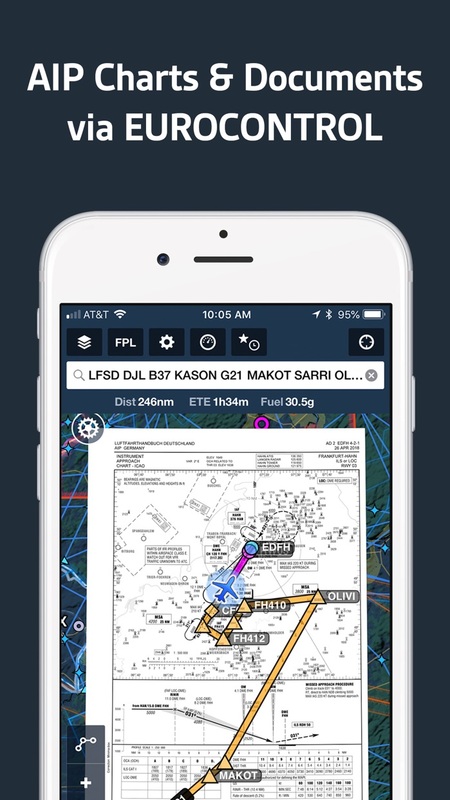 File your flight plan from the mobile app or on the web and receive Calculated Take-Off Time (CTOT) notifications (if applicable to your flight). Our global, redundant AFTN connection provides fast, direct, and unlimited access to filing flight plans with no additional cost or account configuration required. ForeFlight currently supports filing within and between any EUROCONTROL member states and Greenland. Generate a graphical preflight briefing and print a professional-grade Navlog for inflight reference. Overlay a wide selection of interactive weather layers on the Maps view, along with your route line, and quickly see if conditions will affect your flight. View animated radar, global satellite and winds aloft, icing, turbulence, isobars, METAR-based layers, and more. Color-coded METARs/TAFs with decoded text help you quickly interpret conditions. See the real time display of your GPS location on the chart. For ultimate situational awareness, overlay them onto the Maps view, along with weather and hazards in one integrated view. Top-down-view Hazard Advisor map layer, Profile View, automatic Hazard Alerts, and 3D Synthetic Vision seamlessly integrate into the map view for a clear picture of terrain and obstacle hazards anywhere in the world. Features Jeppesen’s high-resolution terrain and obstacle data. Pair with an AHRS source for a backup attitude display on Synthetic Vision.